We came across a number of HTC EVO 3D deals ready for the handset's official launch on June 24th (Sprint's Premier customers will be able to order on the 21st). While most of them, such as Best Buy, RadioShack and Sprint itself are having it for $199.99 on a two-year contract, there are some things you can do to knock the price down, and they are mainly connected with returning your trusted old HTC EVO 4G for the new kid on the Android block. 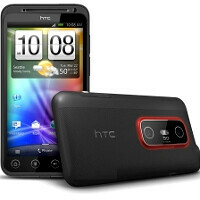 Best Buy has its buyback program, Sprint values your old EVO 4G at $150, and Radio Shack will knock off $100 off the price with an HTC EVO 4G or an HTC EVO Shift 4G return. If you don't have anything to trade-in, Wirefly has the 3D-enabled handset for $179.99. The cherry on the top is placed by Target, however - it will sell you the HTC EVO 3D for $50, when you return your old HTC EVO 4G, and in the press release the store chain sent us, it states that with the 5% off you get when you sign for a Target REDcard, the deal becomes the irresistible $40 for one of the hottest Android handsets ever to hit US shores. Amazon hasn't listed its pricing yet, but we have the feeling it won't be long. Trading in the Evo does not sound like a good deal at all.You could just sell the Evo on eBay or Craigslist for more than $150 easily. You could also simply keep your old phone and not pay phone insurance because if your phone becomes damaged in addition to paying the $8 a month you will have to dish out $100. WTF? Target? Wow... I guess everyone wants in the phone game. Yeah this is probably the only time Target will do this just for the attention. Negative. Target has a permanent trade in program. You can trade in Cell Phones, Video Games, Ipod, and IPads. Just go to the cell phone area in the electronics department. what if i still have 1 more year on my contract with sprint... not elegible for upgrade yet, it says the deal is good when you trade your old evo but that just came out last year and im still stuck with 1 more yr till i can upgrade??? whats the benefit. I'm in the same boat Mr EVO... Will they just extend my existing contract by 2 years and let me get the 3D? Actually, you'll more than likely have to be eligible for an upgrade. Some people have been with Sprint long enough or pay enough each month that they are considered a Gold Premier customer and get to upgrade once a year. This really bugs me, cuz when I signed up for Sprint my line was eligible for an annual upgrade. But Sprint decided to pull some HINDU BULLSH! and change how their Premier status worked. I was in the same boat, as I am not eligible for the full discount for a 2 year contract until January 2012, where as at the end of last year I was going to be eligible for a full discount on a new phone in January 2011. I called their customer care center about this and told them the whole reason I held off on a new phone was because of the Evo 3D, and now I have basically been punshed for waiting, and they took care of it. I guess they have had this complaint a lot, so they will make you eligible for the full upgrade (ie $150 off instead of $75) for the month of June. The phone comes out on the 24th so that shouldn't be an issue as long as you make it out there before the end of the month. The woman I spoke with did say that it was a one time thing though. It only took me about 5 minutes to get this taken care of so I would suggest giving them a call and trying. Good Luck! Yes do this. But I know that you will have to get your E3d from Sprint over the phone as the upgrade will not post to your account. For me, I chatted with a CSR and I was able to get me the same promo but I could go to the Sprint store instead, which I think is better. This is not true. Once you take care of it through the phone center, they will post it so that all vendors will see you are eligible for the upgrade. I called and after waiting on hold for 10mins he said I was all set. I went to Amazon.com and bestbuy.com and they both now show me eligible for the full discount and best pricing. Granted I haven't gone in to try and purchase a new phone yet with this discount, but the rep I spoke with was very clear that it would post to my account and I could buy the Evo 3d at the Sprint Store I preordered it from. I guess I won't know for sure until I try though. Just an FYI only select Target stores even offer Sprint service. I know for a fact none of the Minnesota ones offer it. So good luck getting that offer. Also for Alex this is new in target and stores up there should have it soon. i mean you can go to any sprint store or preferred retailer and you can get a credit of $150 for trading in an HTC evo. that makes the price $50(with a new activation or full 150 upgrade). heck while your at it bring in some other old phones. you can trade up to 3 per device you purchase so you could even get it for free... this isnt limited to just target..
What did you guys tell customer service to let your upgrade be available?